If you "Like" Facebook then you'll love our newest Updates: Now you can "Like" any page on our site and share it with your Facebook friends. And if you "Like" our Facebook account and join us online, then you'll get even more "German Shepherd Goodness" - Just look for the Like Buttons on the Top and Bottom of each page - and also on the bottom of the Left Hand Side Navigation bar. A solid black GSD is a very acceptable coat color in the German Shepherd Dog breed. A black German Shepherd can also make a wonderful pet. Horand was the First German Shepherd Dog ever - the father of the GSD. read on to find out how a chance encounter and a good idea started a dog breed. 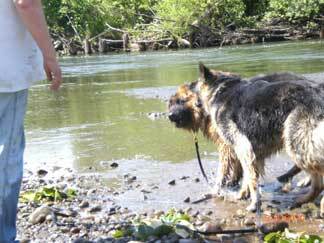 The GSD standard lists the qualities that compose the perfect German Shepherd Dog. Basically, this is a picture in text of the ideal German Shepherd.